There are myriad issues that government agencies, NGOs, and philanthropic organizations must address in their efforts to strengthen communities—economic growth, environmental degradation, affordability, social isolation, access to affordable food and services, freedom of self-expression, to name only a few. Rather than tackling each of these issues separately, more and more groups are aligning around Placemaking as a strategy that not only addresses these disparate agendas, but also shines a light on the critical ways in which they intersect. Quickly catching on to this trend, organizations are beginning to fund multiple Placemaking projects and programs. This is exciting news for Placemakers and communities everywhere! 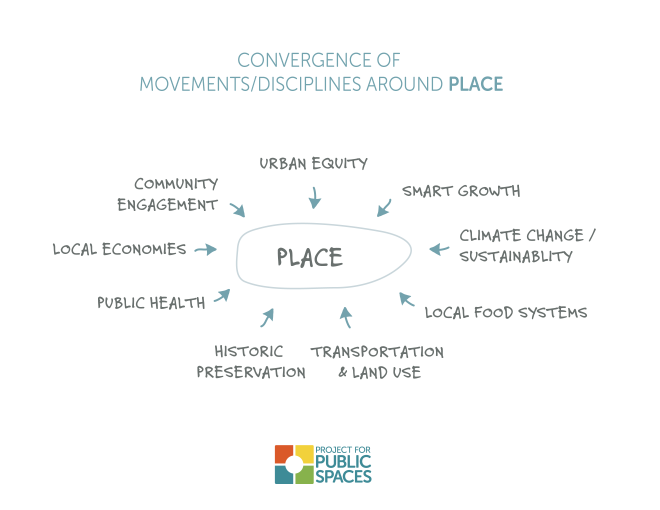 Movements are converging around place and Placemaking to bring new partners to—and yield a more fundamental transformation for—their cause. Don’t get us wrong—one of PPS’s Eleven Principles of Placemaking is that “money is not the issue,” and we still firmly believe this to be true. However, for projects that have a coherent community vision and ready partners, but lack the resources to execute that vision, securing funding can be the spark that turns impassioned ideas into reality. This funding can also help take successful “Lighter, Quicker, Cheaper” programs to the next level—with huge benefits for the community as a whole. After the Placemaking Leadership Council meeting in Pittsburgh, PPS hosted the first ever Placemaking Funders Forum. The event brought together a diverse group of 18 foundations, public agencies, national associations, crowdfunding organizations, corporate funders, non-profit intermediaries and their partners to discuss common challenges of funding Placemaking initiatives, and to find ways to share information to further leverage the impact of their programs. The discussion was masterfully facilitated by Tony Macklin of the Roy A. Hunt Foundation (Tony previously launched the Inspiring Places Initiative, in collaboration with PPS, at the Central Indiana Community Foundation). The Imagination Center in Burnside Park, Providence, RI. Funded by Southwest Airline's Heart of the Community program with PPS. The very diversity in the types of organizations at this forum is itself a testament to Placemaking’s capacity for bridging a wide range of traditional funding categories—community development, civic engagement, arts and culture, environment, and health. How do we talk about Placemaking in an accessible way? 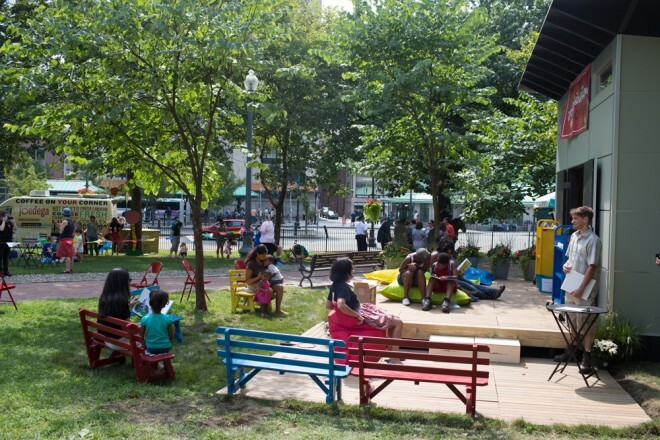 How do we evaluate the full impact of Placemaking? How can we create a common set of standards and indicators, along with specialized metrics for target audiences? How does Placemaking address issues of equity? How do we best increase the capacity of local leaders and grantees to make change? How do we build a value-added network for cooperation? Together, by sharing resources and experiences, this group will create scalable, accessible tools to help measure and communicate the outcomes of Placemaking projects more effectively. This is a critical step in bolstering the “case-making for Placemaking,” as one attendee put it, and it will be another resource from which zealous nuts and place managers can draw, as they work to enhance their public spaces. Another big step for Placemaking funding comes from the Kresge Foundation, which has long offered visionary leadership for Placemaking as a philanthropic strategy. Their support for the Placemaking Leadership Council is providing dedicated resources to foster the vigor and growth of Placemaking networks. The Placemaking Funders Forum will be brought under the umbrella of the Leadership Council, with PPS continuing to serve as a facilitator—connecting funders, communities, and public space managers with relevant funding programs and useful tools. We’d love to hear more input about how Placemaking funding can be made more effective. Please let us know what you’re thinking: leadershipcouncil@pps.org.